I’ve been to Trinity Buoy Wharf at least half a dozen times over the years, as well as photographing it from the River Thames and North Greenwich. For some time it has been home to a number of artists and I’ve visited several of their studios, as well as going to a very nice party there on the riverside with splendid views across to the Millenium Dome. So it was good to pay another visit during the event there as a part of the London Open House event and to see how things were progressing. The answer is rather slowly – one of the displays was a model of the prize-winning bridge design to provide a walkway from Canning Town station to the site, which appears to be no nearer completion than when the prize was awarded a couple of years ago. 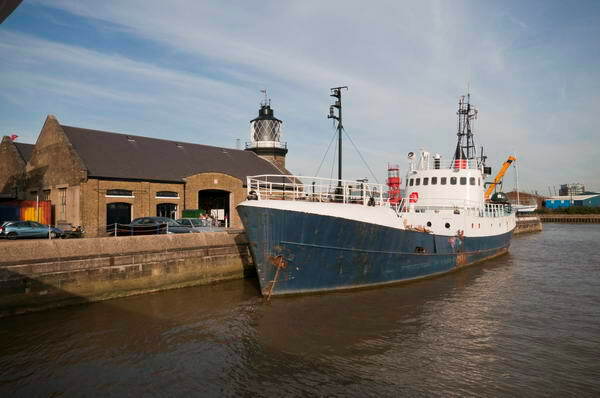 Longplayer of course continues in the Lighthouse there – another 992 or so years to go in this lengthy musical work in London’s only lighthouse. 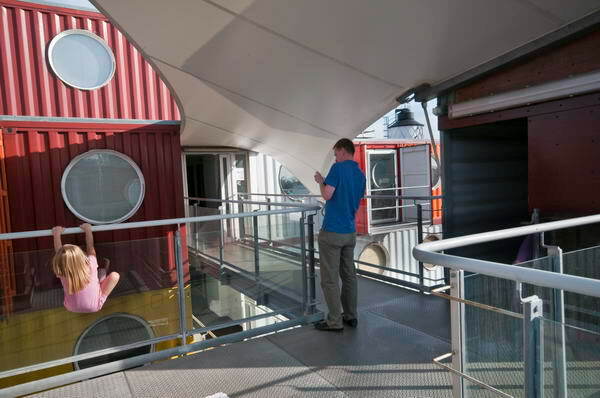 The biggest change since my earlier visits is ‘Container City,’ an artists’ complex made – as the name says – from containers, and there is now a new building close to the bank on the west of the site. As a part of the event, there was a free ferry service across the river to the pier at North Greenwich. So I took it and walked the 3 miles or so to Greenwich. I was born and brought up a Protestant, although my own parents were considerably more open-minded than some and probably regarded Catholics as misguided rather than as the evil followers of the Antichrist; they even knew and talked to some, though sensibly kept quiet about this. It wasn’t in Northern Ireland, and my parents had chosen not to worship at the church where the rest of my father’s family went, occasionally visited by and spiritually if not physically in the see of the The Rt Honourable The Rev’d Ian Paisley. Later in my seven years in Manchester I often attended a Presbyterian church, eventually learning to cut through the preacher’s powerfully Northern Irish accent to find his views were considered and moderate. Because of this background more than most English I feel a understanding of groups such as the Apprentice Boys of Derry, even though I don’t share their views. 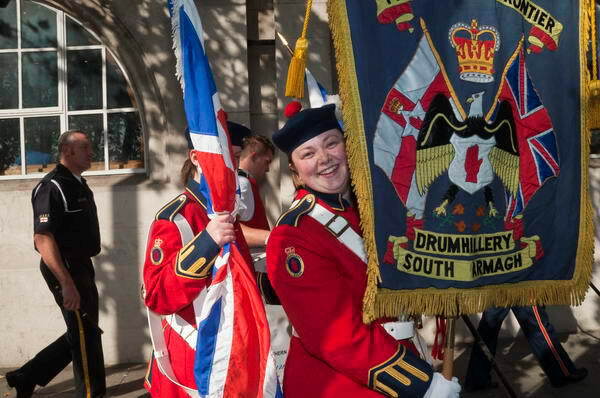 Protestant marches in Ulster are a way of displaying tribal loyalty and showing a cultural defiance, a clear display both of cultural difference and of superiority. 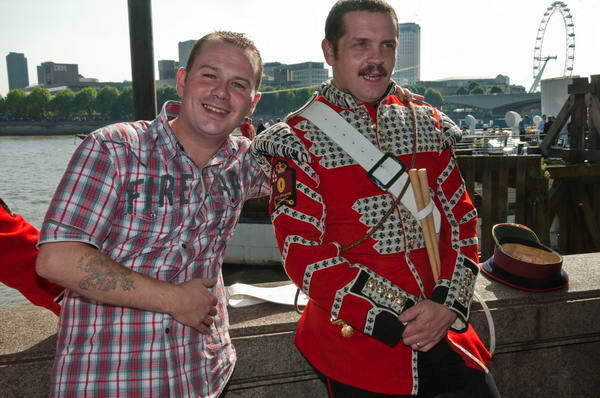 Often they have acted as a catalyst for violence between the communities, stirring up hatred that has lead to killings and maimings by both ‘Catholic’ and ‘Protestant’ terror groups. In London, they are just celebrating a culture and I can’t imagine anyone on our streets feeling in the least intimidated or upset by their marches. They are, as one man put it to me – “having a fine day out and enjoying ourselves.” But this very large man wearing dark glasses did rather spoil the effect by attempting to prevent me taking pictures and to intimidate me, pushing me backwards through the crowd and telling me very firmly to leave the area. I don’t have a problem with people marching in my city, but I do object to being threatened and intimidated on its streets. This man attempted to justify his unacceptable behaviour by saying that someone had told him that I was a photographer who worked for a left-wing newspaper. Unfortunately it’s untrue (I could do with the money, though left-wing publications seldom have any.) But even if I were, it would be no excuse for his attitude and his assault. I asked him who had told him this nonsense, but he wouldn’t say – probably it was a story he had made up. The only people I recognised at the event apart from other photographers (including one who does work for a left-wing publication) were several police officers including the FIT team who have photographed me on so many occasions – although I didn’t see them doing so at this event. Unfortunately none were in the immediate area when the incident took place, and in any case I preferred to keep on working rather than stop to make a complaint. Most of those I met were happy to talk and to be photographed, but the incident did leave a nasty taste in my mouth. If the Apprentice Boys want to get a better press in London they really need to take the lunatic fringe responsible for this kind of behaviour in hand. It was good to see so many people enjoying themselves, and doing so by taking part in something with other people. Community festivals such as this have an important role in building the kind of relationships that lead to healthy communities. 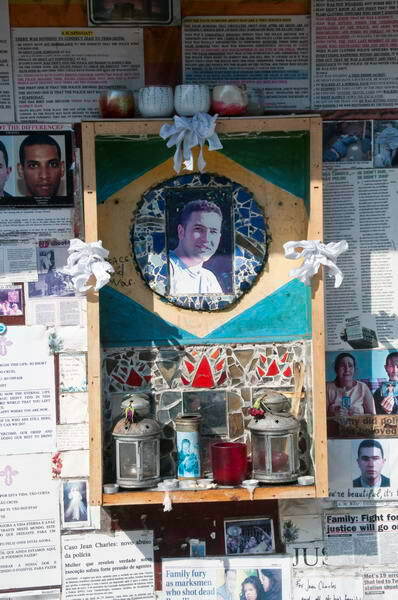 But among the dancing and fancy dress I also found a reminder of violent death, Stockwell is probably best known for a murder committed there by police in 2005, when an unarmed Brazilian man was brutally shot just after boarding an underground train at Stockwell Station. The inquest on Jean Charles de Menezes opens at the Oval on Monday 22 Sept. 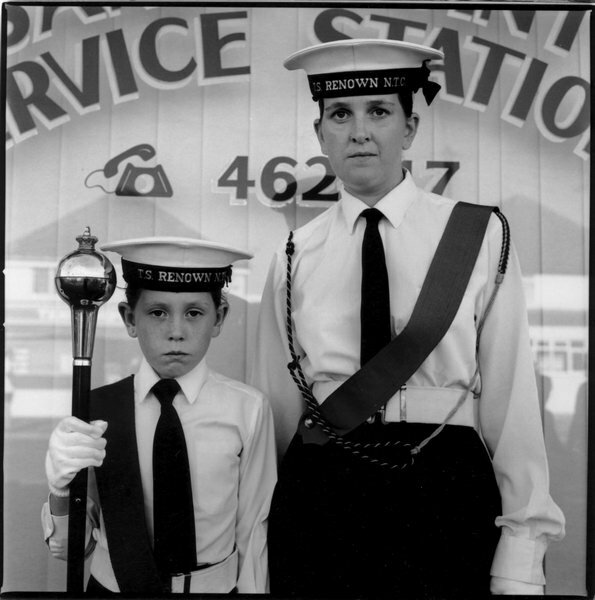 The shrine to him at Stockwell station is in the background of a number of my images – and I also photographed it. At top left the man police mistook him for – who bears little or no resemblance. Death was very much on my mind; I’d spent the previous day at a family funeral and although the event gave some closure I remained grief-stricken and still rather in shock from the sudden and unexpected death almost two weeks earlier. 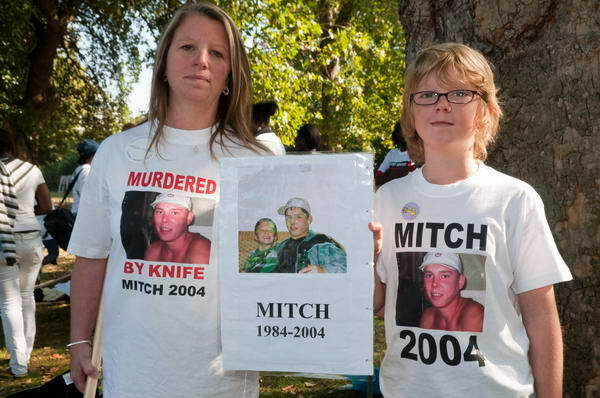 So coming to ‘The People’s March‘ against gun and knife crime on 20 Sept, my heart went out even more than usual to the mothers and fathers who had lost their sons, to the brothers and sisters of those who had died, and those who had lost their friends. So many of those marching were the families and friends of young people whose lives were ended prematurely by violent death, and the grief felt by many of those I photographed was impossible to miss. They were stricken and angry and demanding that something was done to stop the killing. 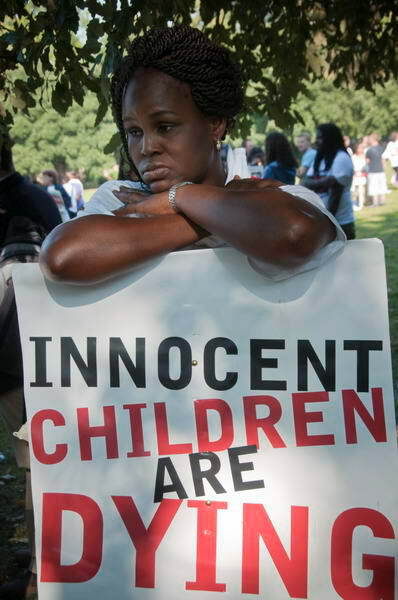 But it is hard to see what can be done, and how marches like today’s event really contribute to this. Effective action would involve huge cultural shifts and a direction of change that would reverse much of what we have seen over the past 50 or so years. 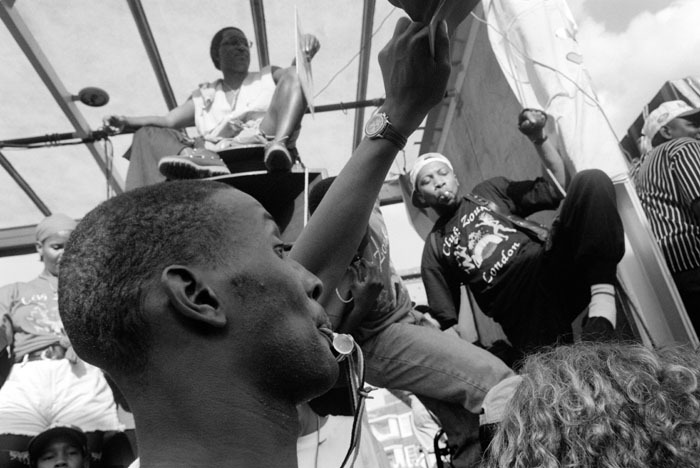 The liveliest part of the protest was a Christian group; black-led churches have played an increasingly important part in the community over the last 50 years but don’t seem to have had a great effect in stopping the growth of gun and knife crime. This march from Kennington Park, organised by the Damilola Taylor Trust and supported by the Daily Mirror and Choice FM came at the end of London Peace Week. It turned out to be on a slightly smaller scale than the publicity suggested, with perhaps around a thousand marchers leaving Kennington Park, to join other marchers from Camden for a rally in Hyde Park – which, according to the Mirror was attended by 5,000 people. I left the marchers as they walked out of Kennington Park to make my way to a festival in Stockwell which I hoped would cheer me. More from the Peoples March on My London Diary. One of several reasons why I haven’t posted much here in the last couple of weeks is the problems I’ve had with Lightroom 2.0. Having been preaching for some time that Lightroom was the best thing for photographers since Linda’s unsliced wholemeal bread (I taught her breadmaking shortly after we were married, and who would ever want to eat sliced white again) I was keen to install Lightroom 2.0 when it came out (even though unlike the original it did cost me real money. But along with a considerable proportion of other adopters, I found that 2.0 turned importing a day’s pictures from being soemthing that happened while you had a quick meal into an overnight job. I searched the web for answers – and none of the advice I found helped at all, though it probably was a good idea to update my video drivers. Even posted on the Lightroom forum, though only got sympathy rather than answers. It was frustrating as well as time-consuming. Installing 2.1 seemed to have broken my previous 1.4 installation (despite assuarances it wouldn’t) so reverting to the older version wasn’t a straightforward option. And once the images had been imported, there were some exciting new tools, especially a great way to dodge and burn selective areas, removing one of the main reasons for needing to export images to Photoshop. Today I found, downloaded and installed the release candidate for Lightroom 2.1 and I’m pleased to say it seems to have sorted that problem at least. From the release notes it looks as if what was happening was that 2.0 was trying to write to my second monitor, and this computer only has one connected. RC 2.1 does seem to offer a blisteringly fast import of files, although the writing of standard previews that occurs following this is still perhaps a little slower than with 1.4. And if there are any photographers still wondering if Lightroom is worth using, I’d suggest you take a look (Aperture is another possibility for Mac users.) If you shoot RAW it’s a great piece of software, doing all you need for most pictures from camera to client (there is still the occasional image – now well under 1% – where I need to use Photoshop as well.) If you only shoot jpeg, you should know by now you are missing out on what digital can offer you, although on those few occasions when I have shot jpegs – mainly by accident – – Lightroom has also proved its worth. It isn’t cheap software, but much more reasonably priced than Photoshop itself – and this in itself may be doing Adobe some good. I’ve yet to meet a photographer with a pirated version of Lightroom, though dodgy versions of Photoshop seem widespread. You can download a trial version of Lightroom, identical to the full version except that it will stop working after 30 days, as well as get more information, from Adobe. With any printing system using a computer the aim is to make good prints that correspond to the image that you see on screen. I made my prints using Photoshop, which displays images making use of a print space. Since I was printing black and white images I chose to use a grayscale print space, and for simplicity I chose my default grayscale working space, Gamma 2.2 – although other working spaces should give identical results if applied both to screen and in printing. I started by reading the very useful work on simple black and white printing by Clayton Jones and then decided to try an even more straightforward approach! Here, in a more or less logical order are my notes on how I did it. The monitor was calibrated to the usual D65 (6500K) and Gamma 2.2 that I use to get accurate colour. I scanned the negatives at the highest optical resolution my films scanner will give (4800 dpi for 35mm negs.) I use Vuescan as the scanner driver, preferring the results from this to those from either the Minolta software or Silverfast, particularly for negatives on chromogenic films (scanned as colour negative) but it also does a good job on black and white. I use a light amount of Infrared cleaning on chromogenic negatives and no grain reduction. Most automatic cleaning processes increase scan time and destroy detail. The scan at 4800 dpi allows for excellent prints up to around 24×16″ and so long as the negatives (and scans) are sharp you can go larger, with cost being the main limit! Of course the quality of your prints will depend critically on good scans, and if you have any doubt about this, it may pay you to have scans made commercially on a drum scanner. Using a Minolta Dimage Scan MultiPro with a Scanhancer diffuser and setting Vuescan to sample the image four times gives similar quality to drum scans – just a pity that scanner is no longer available. Files are saved as 16 bit grayscale tiffs and with gamma 2.2 – my Adobe Photoshop grayscale working space. You can print from 16 bit tiffs and it is bet8-818-6er to keep this format in case you want to work further on the images. The first task is to spot the image, working at 100% view. get the image looking exactly how I want it on the monitor, spotting, adjusting contrast and levels, dodging and burning (I find it easier to work most of the time using rough selections with considerable feathering and then to apply either levels or curves rather than either the dodge/burn tools or working with layers and masking etc – it just seems more like I used to do it in the darkroom.) I then save the file, and apply a small amount of mainly edge sharpening with the Focal Blade plugin ready for printing. In the print preview window, selecting colour management, select the Document: Gray Gamma 2.2 as the source space, and the print space to “Same as Source“. See below for some comments on the maximum size and margins required. Click on the print button and then make the printer settings. To print on glossy papers such as PFBG, you need to use the glossy photo black (PB) ink cartridge instead of the matt black used for matt papers. With this loaded you should be able to select Epson Premium Glossy as the paper type. Then chose ‘Best Photo‘ for print quality. Check the paper feed (Sheet), paper size settings and orientation are correct. Empty all five boxes under ‘Print Options’ and select ABW. In the ABW settings, choose ‘Fine Adjustment‘ and ‘Normal‘ and adjust the Horizontal and Vertical settings to give the ink colour you prefer – I found 3v and 3h gave a very slightly warm neutral which I liked. Leave all other settings at 0 or empty and ‘OK’ the dialogue. In the paper configuration dialogue I found a Color Density of around +2 gave a slightly better match between screen and print. Finally, on the maintenance tab of the printer properties, checking the ‘thick paper’ box will cut down the paper handling problems (see below) slightly, though you will have to confirm this when you print. The main problems I had in making prints on PFBG were in loading the paper and in avoiding catastrophic collisions between paper edge and print head. PFBG – at least after some months of storage in my dampish house – is never flat, but curls up considerably along the long edges. Possibly this could be corrected by leaving it under heavy objects for a day or two, but a quicker method is to place a pile of several sheets face down on a clean sheet of cheaper paper, then roll the whole pile up from each short end in turn. It’s also worth doing a little rolling against the curl along each long side of the heap. At first I had great problems in getting the paper to load at all, even after this flattening, although some other papers were loading without problems. The solution was to clean the roller that pulls it into the printer. I borrowed a glass drying cloth from the kitchen, folded it a few times and dampened it, then held the moist (but not dripping!) pad reasonably firmly against the rubber roller while pressing the paper feed button to make it attempt 3 or 4 print load cycles. After this, I fed a sheet of cheap paper through the printer a few times to remove any moisture or dirt – always a good idea before feeding in your paper that costs a couple of pounds for an A3 sheet. I soon also found that it was not possible to reliably use the whole print area of the A3 sheet. Even with the paper flattened as described above, there was still the occasional slight clip of the paper edge by the print head, which wasn’t a great problem while the sheet was held by the rollers, but knocked it askew once the end had emerged from these. So although A3 paper is 420 mm long, the longest print you can make is around 380mm, with a left margin (assuming a landscape format print) of around 2mm and a right margin approaching 40mm. It annoys me to print off-centre like this, but it’s even more annoying when the print-head catches the paper edge and messes up the print. While the print is emerging from the printer (its appearance on the paper, gradually building up through multiple passes of the print-head has much of the same magic as the image appearing in the developer tray) it also can help avoid clipping to hold the edges of the paper down slightly as it leaves the front of the printer. But even so, most of the prints I made have slightly messy edges. You can see the results of my printing session on show in English Carnival at the Shoreditch Gallery at The Juggler, 5 Hoxton Market, London, N1 6HG from 29 Sept- 31 Oct 2008 (Mon-Fri 8am-6pm, Sat 10-4pm, closed Sundays. ) You are welcome to the opening on Thursday 2 Oct, 6.30-8.30pm. This is one of over a hundred exhibitions and events in London as a part of photomonth 08 (this years web site with full details should be on line shortly) making this the largest photography festival in the UK. *Hoxton Market is just off Pitfield St (between Coronet St and Boot St), close to Old St tube. The show runs from 29 Sept- 31 Oct 2008, weekdays 8-6 : Sat10-4 : closed Sun and is a part of Photomonth 2008, the East London photography festival. 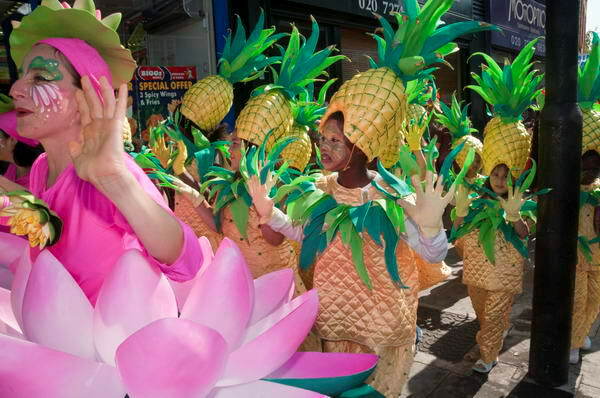 English Carnival shows the work of four documentary photographers who have each been inspired by the carnival tradition and carried out long-term projects on Carnival in this country. Although they have at often worked together, each has a distinctly different approach to the subject in their photography. 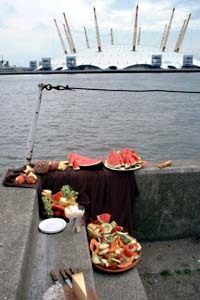 All four photographers have shown work extensively and their pictures have been published widely in books and magazines. 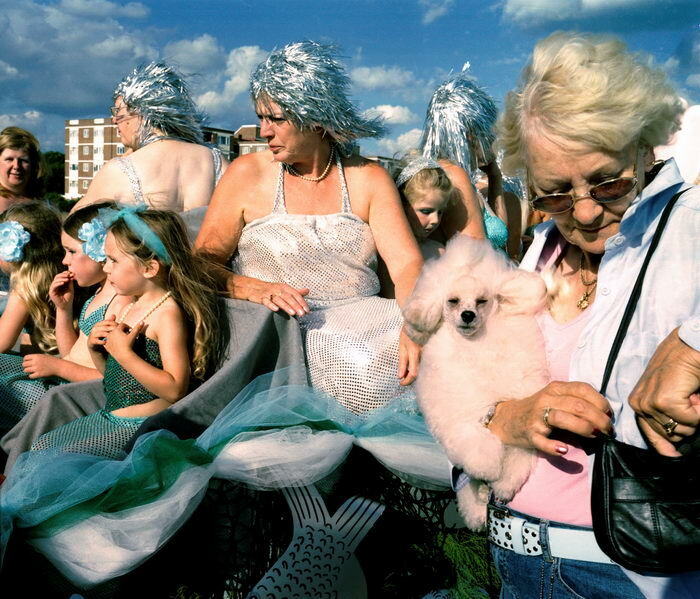 Paul Baldesare and Bob Watkins have photographed traditional English carnivals since the early 1990s, and they received an Arts Council National Lottery Grant in 1997-8 to continue their project. A show of their work organised by Kent Arts toured a number of venues in the South East. 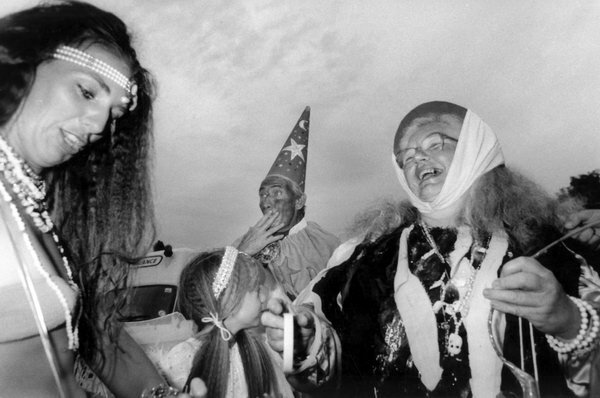 Baldesare in colour and Watkins in black and white both show the highly idiosyncratic and sometimes esoteric side of the traditional carnivals that result in their peculiar fascination. 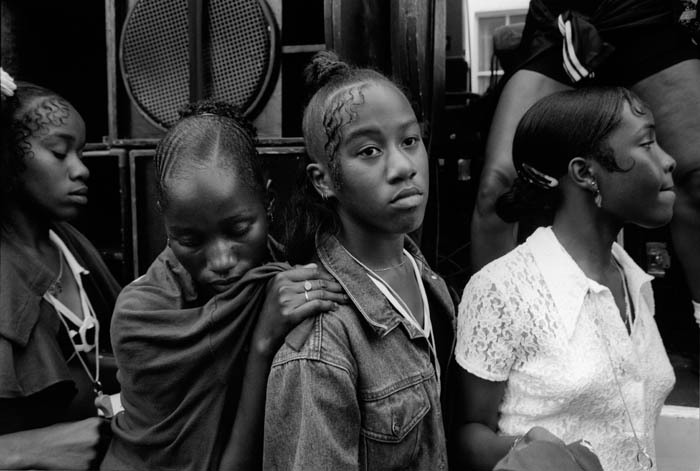 Peter Marshalls black and white prints from the 1990s are from Notting Hill in Carnival , published in Visual Anthropology Review in 1999 with an essay and comments on the pictures by George Mentore, who took part in Notting Hill in the 1970s. You can see more of the work on these projects at the English Carnival website, and a selection will be on show at the Shoreditch Gallery. Please do come if you can – I hope to meet some of you at the opening. US – Hands Off Latin America! 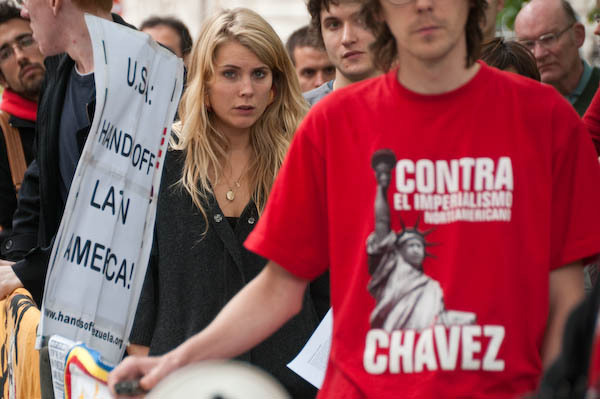 More than 50 activists turned up for an emergency picket of the US Embassy in Grosvenor Square London on Wednesday 17 Sept called at short notice by the Bolivia Solidarity Campaign and Hands off Venezuela, with the support of Equadorians in the UK, Colombia Solidarity Campaign and Global Women’s Strike. 35 years after a CIA-backed coup brought down the Allende government in Chile, the US are still at it, backing right-wing violence that has killed over 30 supporters of the Bolivian president Evo Morales and setting up a plot to get rid of Hugo Chavez in Venezuela. Both countries have expelled their US ambassadors in response to these attempts, which seem to be part of a Bush initiative to end his time in office by pulling down any left-wing governments in Latin America. Equador is also under threat from such illegal actions by US agencies. 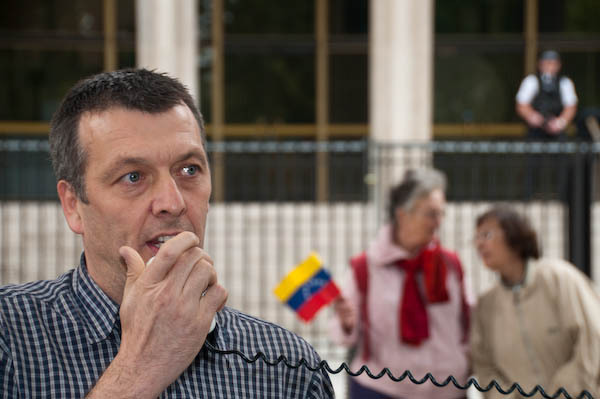 There were a number of speeches in English and Spanish, including one by NUJ General Secretary Jeremy Dear. The picket was followed by a rally at the NUJ’s offices with speakers expected to include ambassadors, MPs and union leaders, although I was unable to continue to this. The area around the US Embassy has been extensively remodelled, establishing a pedestrian area in place of the roadway and also surrounding the building with reinforced bollards to prevent vehicle attacks. It does make it a more pleasant area in which to hold protests. 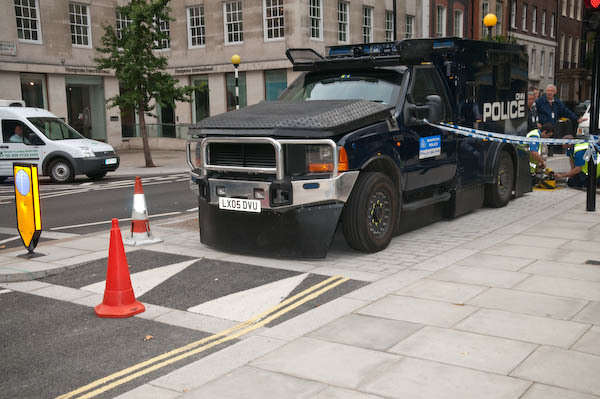 While the picket was being held, one of the Met’s Jankel armoured Guardian TIV (Tactical Intervention Vehicles) was at the south corner of the area and work was being carried out on one of these bollards. Jankel is a Weybridge-based company (with strong connections to Jordan) that specialises in conversions such as these heavily armoured bomb blast and bullet proof vehicles on a Ford 4×4 truck chassis. Company founder Robert Jankel, who died in 2005, was earlier noted for his sports and luxury car designs. These sinister looking vehicles are often used around Heathrow and also carry the specialist firearms officers of CO19 – they can transport 6-8 officers. You are currently browsing the Re-photo blog archives for September, 2008.